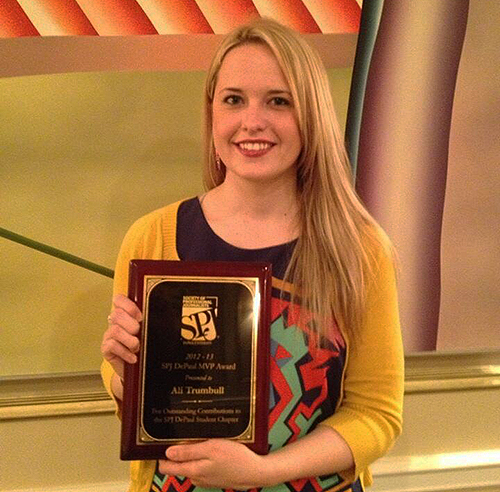 Outgoing SPJ DePaul President Ali Trumbull took home the SPJ DePaul leadership award Saturday at the DePaul College of Communication graduation brunch at the Union League Club. The award is given annually to the student executive board member who exhibits strong leadership and journalism skills. Trumbull, who received a master’s degree in journalism, has been a three-year DePaul executive board member and was one of the founding members. Besides president, she also served as events coordinator and PR/membership director. The organization has won several awards during her time on the e-board, including the 2011 SPJ National and Region 5 Student Chapter of the Year awards. As president, the chapter grew to 75 members, one of the largest in the country, and completed all of its required events and programs two months before the required deadline. She’s been nominated for the national SPJ student leadership award, and has conducted student chapter training seminars for the SPJ national Ted Scripps Leadership Institute. A former intern at the Chicago Tribune Metromix and NBC 5 Chicago investigative unit, Trumbull will start a full-time job as a web producer at the Chicago Sun-Times the day after graduation.